Speaking at today's GPU Technology Conference in San Jose, NVIDIA co-founder and CEO Jen-Hsun Huang took the wraps off the future of the Tegra platform. That future looks pretty bright, as NVIDIA says they want mobile devices to be able to "do everything a modern computer should do." 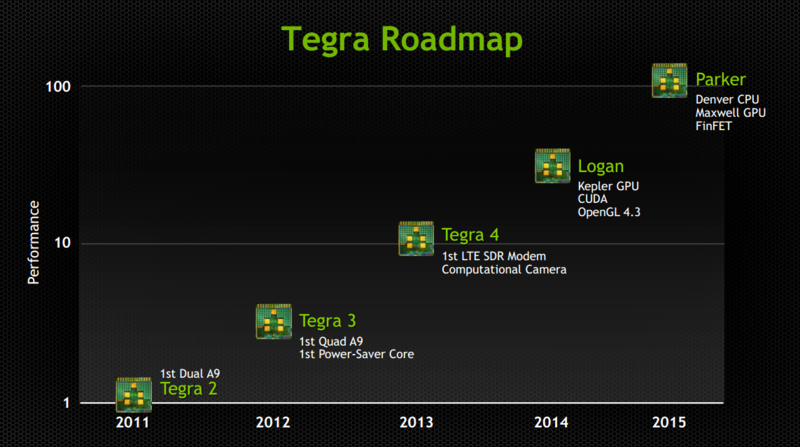 Enter the next-generation "Logan" and "Parker" Tegra processors. The Logan (that's a code name for what will likely be the Tegra 5) will offer a Kepler GPU, with support for CUDA and OpenGL 4.3. The Kepler GPU is a big boost from previous GeForce models, and offers two pretty exciting (for developers, anyway) features -- Dynamic Parallel computing, where the GPU can spawn it's own threads without going back to the CPU, and Hyper-Q threading which allows more than one CPU core to simultaneously utilize the GPU. Nerdy stuff to be sure, but it means even better gaming and 3D performance for the apps and games we all love. CUDA is GPU computing. While your mobile CPU works hard to crunch the numbers, normally the GPU sits idle unless it's supposed to be drawing something. With CUDA implemented, that array of high clock speed GPU cores is doing a lot of work right along with the CPU cores. Modern desktops use GPU computing, as do many "supercomputers" we read about at research facilities and laboratories. Expect CUDA support to make a significant impact on applications specially designed for it. Expect to see Logan chips in production early next year. Things wont stop there. Jen-Hsun also talked a little about the "Parker" (Tegra 6?). Parker will sport the all-new 64-bit Denver CPU and Maxwell GPU cores, The big news here is the use of FinFET transistors. Hardware geeks and EE's everywhere are pretty excited about FinFET transistors, and the way they are going to radically change the way ARM chips are designed and built. They cut "leaked" (read: wasted) power by up to 90-percent, and are about 40 to 50-percent faster while using half the power of the current transistor model. This means they can process information twice as fast as chips we have now, without using any extra power. Of course, that also means chips can be designed to process data as fast as they do today, while using half the power. NVIDIA is excited about what they have in store for mobile computing, and so are we. As this sort of technology works its way onto ARM devices, we'll have phones and tablets that are as powerful as the current best-in-class laptops -- with games and apps designed to take advantage of it all.